Yesterday, Sunday, August 3rd, Jonathan and Danielle took Chuck and Lois to Winterthur (Wintertour is the pronunciation given to us on the tram tour)for their 35th wedding Anniversary. Winterthur is located in Delaware and is the vision of Henry Francis DuPont (he expanded the existing house on the property into a museum and then opened it up to the public). In addition to the house dedicated to preserving America's history through a collection of decorative arts including furniture from many different time periods up until 1860, china, pottery, silverware, and the period rooms many of which have been taken out of buildings that were being demolished serving as a backdrop to the antiques) there are hundreds of acres of gardens to walk and enjoy. The most impressive feature we saw (we only took two tours of the house and want to go back and see the rest of the house) was the Montmorenci staircase (three floors of spiral stairs unsupported) built from the design of a southern staircase purchased by DuPont. The staircase is supported internally by concrete and metal but to stand at the bottom and look up three floors to a complete 360 degree turn is worth the trip to Delaware if that was the only thing you would see. But that is not the only thing to see there are nine floors and over a hundred rooms full of antiques and a record of America's history through the very items that were used everyday by our forefathers.The Historic American Buildings Survey (HABS) began in 1933 now contains the written record with drawings and photographs of 35,000 historic structures. This is a digital collection managed by the Library of Congress. Many buildings we have been involved in restoring have been featured within this collection. Searching the HABS for your building or buildings in your area can give you clues to the remodeling completed on your structure. This provides a good place to begin researching your building's history and gives you a snapshot of the time period when the HABS was recorded. You can search the collection at http://memory.loc.gov/ammem/collections/habs_haer/. This is just one of the many tools available to help you research the history of your building.No, this post is not going to feature more pictures of the "girls" our office dogs. We are at the end of a heat wave in Pennsylvania and I am feeling like a trip to the pool is in order. We received our contract for The Greater Philadelphia Historic Home Show in January in the mail this week - that has us thinking about our plans for next year and what we can do. We are also working on our class schedule for 2009 - please let us know if there are any topics you are interested in that we did not offer this year. On Sunday morning after breakfast we walked down to Building Character (www.buildingcharacter.biz) in the 300 block of North Queen Street in Lancaster. They were having their Sunday Market (organic food vendors, local produce,with live music and architectural details for sale). I bought a picture of one of the Star Barn's (locally famous on Route 283 outside of Harrisburg - soon to be moved to Lebanon) outbuildings (which I consider more architecturally interesting than the main barn). The outbuilding was built in the Gothic Revival tradition and features an interesting cupola. Anyway I digress -Building Character is not the typical architectural salvage store - they attach history of the pieces if they know it and they are blending architecture with art. In the same way we try to do with our work. If you have an opportunity, I recommend visiting Building Character for a unique shopping experience (if you have a chance to visit on Sunday you can also grab lunch).Green building is all the rage in the building industry. I can not open a remodeling or design/build magazine without a reference to a green building project. Preservation and restoration work is green in it's approach. By using resources (building materials) that have already be harvested on land that has already be cleared is a greener approach than building a brand new building using new green materials. When you are building a new building you have to create the resources, ship them to the building supply store, and then ship them to the job site on the newly cleared land (from farmland, forest, or a tear down). Storm Cunningham in The Restoration Economy (covering all aspects of the restoration economy natural and built environments) states that 25% of all landfill waste is from construction activities. By reusing the salvaged materials from buildings that are being torn down in our restoration projects we are keeping those materials out of the landfills. It is easy with these new green materials to refer to new building as green. The new building materials are green for a new building approach but that approach is not necessary the best method when working on an older home (one built before 1945). There are ways to take a green building approach when dealing with your older building that does not include retrofitting inappropriate modern materials.The production crew spent the last week in Staten Island, New York repairing/rebuilding a cornice on the Curtis house. We have been working on this project since April the original scope of work was repairing the original porch and making traditional (single pane, true divided light) windows for the first floor. The scope of work has grown to the restoration of the entire front facade - removing aluminum siding, repairing rot and portions that the siding installers cut the architectural details away. Back at the office our June newsletter was mailed (a day late) and we are investigating the e-newsletter options on Constant Contact. If you would like to be added to our e-mail list please e-mail dkeperling@practicalpreservationservices.com. In our June newsletter we introduced the Speedheater Paint Removal System - if you are interested in a demonstration or rental please call us we would be happy to accommodate any requests. The office number is 717-291-4688. Father's Day Weekend we had a wood window repair class. We enjoyed our time teaching and getting to know the participants - look for pictures and video of this class to be added to our website soon. One thing that we have heard from almost all of our participants is that they thought there was some mystical secret to restoration. We spent sometime during the class discussing that the majority of restoration work can be taught within a relatively short amount of time - these usually are the repetitive labor intensive projects - and if the building owner is willing to contribute some "sweat equity" the cost of restoration can be greatly reduced. Of course there is a percentage of the work in which skill and expertise are required - which is the work we enjoy doing (the detail orientated - finish work). Have a happy Fourth of July - enjoy sometime with your family cooking out and watching fireworks!Historic Preservation Incentive Program (HB 221) is a piece of pending legislation that will help preserve historic structures across Pennsylvania. The legislation is designed to encourage people buying, selling, or dealing with historic buildings to be sensitive to the buildings history. This legislation will give more incentives to homeowners and developers making more grants and tax credits available for the preservation/rehab of historic structures. This legislation would help the state in multiple ways: preserving our collective built history, encourage economic development, and reinvest capital in our cities and towns. Twenty-nine other states have already enacted similar legislation. The budget negotiations are going on right now and are scheduled to conclude next Tuesday, July 1st. Contact Governor Rendell, your State Senators, and House Members. Let them know how important our historical resources are to you. For more information regarding HB 221 contact the National Trust for Historic Preservation at http://www.nationaltrust.org/ (information is available on the advocacy page of their website along with a letter to e-mail to your local representatives and Governor Rendell). Today is the first day of summer and also bring your dogs to work day. So we decided to bring our dogs to the office and take pictures of them in while they "work". Delilah (Jack Russell), Analiese (White German Shepherd), Bernadette (Am Staff), and Angelica (Pug) have made our day a little more exciting. On a more serious note we had a successful hands-on plaster class last weekend (June 14th and 15th). We have posted pictures and video from this class on the class portion of our website. Chuck and Jonathan spent both days teaching how to plaster an entire wall from scratch using lathe and a traditional three coat plaster method, how to patch holes, and how to repair cracks. Despite the warm weather everyone left feeling confident in their ability to tackle the plaster projects in their own homes - which was our goal. Last Saturday, June 7, Chuck, Lois, and Danielle drove to Bellefonte, Pennsylvania (right above State College) to conduct a seminar for the Borough of Bellefonte as part of their wood window seminar day in the park. There where various other exhibitors (replacement windows, storm windows, and stained glass window experts with booths) as part of the window fair. It was a hot day with high humidity on top of the heat - I would describe it was oppressive. We made due with the weather (which impacted the turn out) and moved our presentation into the park gazebo were there was shade and benches for the attendees. Despite the small crowd we had a good time discussing the importance of wood windows to a historic building, the replacement cycle (caused by inferior new growth wood and modern construction practices) (the replacement window salesman was not happy with this aspect of the discussion), storm window options (interior and exterior), the energy efficiency of wood windows (with support from the University of Vermont Wood Window Report - showing the energy savings is less than a dollar a year when wood windows are replaced with modern replacement windows - a copy is available under the Services section of our website), how to make wood windows more energy efficient, and a demonstration of the steps to repair wood windows. We enjoyed sharing our knowledge with the few concerned homeowners and the Borough of Bellefonte's available HARB members. We look forward to visiting this Victorian city again in the near future.We are a residential restoration company focusing on the preservation of our collective built history for future generations. We hope to help educate our clients and the general public to care for their older buildings and make decisions that will benefit the preservation of the building. This is our first venture into the world of blogging. We will complete at least one posting a week regarding some form of preservation/restoration news, information, or trivia. We often make presentations to preservation groups and will highlight those presentations as well as our hands on classes within our blog and on our website. Yesterday, Sunday, August 3rd, Jonathan and Danielle took Chuck and Lois to Winterthur (Wintertour is the pronunciation given to us on the tram tour)for their 35th wedding Anniversary. Winterthur is located in Delaware and is the vision of Henry Francis DuPont (he expanded the existing house on the property into a museum and then opened it up to the public). In addition to the house dedicated to preserving America’s history through a collection of decorative arts including furniture from many different time periods up until 1860, china, pottery, silverware, and the period rooms many of which have been taken out of buildings that were being demolished serving as a backdrop to the antiques) there are hundreds of acres of gardens to walk and enjoy. The most impressive feature we saw (we only took two tours of the house and want to go back and see the rest of the house) was the Montmorenci staircase (three floors of spiral stairs unsupported) built from the design of a southern staircase purchased by DuPont. The staircase is supported internally by concrete and metal but to stand at the bottom and look up three floors to a complete 360 degree turn is worth the trip to Delaware if that was the only thing you would see. But that is not the only thing to see there are nine floors and over a hundred rooms full of antiques and a record of America’s history through the very items that were used everyday by our forefathers. The Historic American Buildings Survey (HABS) began in 1933 now contains the written record with drawings and photographs of 35,000 historic structures. This is a digital collection managed by the Library of Congress. Many buildings we have been involved in restoring have been featured within this collection. Searching the HABS for your building or buildings in your area can give you clues to the remodeling completed on your structure. This provides a good place to begin researching your building’s history and gives you a snapshot of the time period when the HABS was recorded. You can search the collection at http://memory.loc.gov/ammem/collections/habs_haer/. This is just one of the many tools available to help you research the history of your building. No, this post is not going to feature more pictures of the “girls” our office dogs. We are at the end of a heat wave in Pennsylvania and I am feeling like a trip to the pool is in order. We received our contract for The Greater Philadelphia Historic Home Show in January in the mail this week – that has us thinking about our plans for next year and what we can do. We are also working on our class schedule for 2009 – please let us know if there are any topics you are interested in that we did not offer this year. On Sunday morning after breakfast we walked down to Building Character (www.buildingcharacter.biz) in the 300 block of North Queen Street in Lancaster. They were having their Sunday Market (organic food vendors, local produce,with live music and architectural details for sale). I bought a picture of one of the Star Barn’s (locally famous on Route 283 outside of Harrisburg – soon to be moved to Lebanon) outbuildings (which I consider more architecturally interesting than the main barn). The outbuilding was built in the Gothic Revival tradition and features an interesting cupola. Anyway I digress -Building Character is not the typical architectural salvage store – they attach history of the pieces if they know it and they are blending architecture with art. In the same way we try to do with our work. If you have an opportunity, I recommend visiting Building Character for a unique shopping experience (if you have a chance to visit on Sunday you can also grab lunch). Green building is all the rage in the building industry. I can not open a remodeling or design/build magazine without a reference to a green building project. Preservation and restoration work is green in it’s approach. By using resources (building materials) that have already be harvested on land that has already be cleared is a greener approach than building a brand new building using new green materials. When you are building a new building you have to create the resources, ship them to the building supply store, and then ship them to the job site on the newly cleared land (from farmland, forest, or a tear down). It is easy with these new green materials to refer to new building as green. The new building materials are green for a new building approach but that approach is not necessary the best method when working on an older home (one built before 1945). 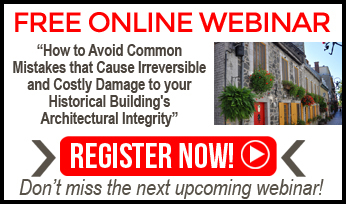 There are ways to take a green building approach when dealing with your older building that does not include retrofitting inappropriate modern materials. The production crew spent the last week in Staten Island, New York repairing/rebuilding a cornice on the Curtis house. We have been working on this project since April the original scope of work was repairing the original porch and making traditional (single pane, true divided light) windows for the first floor. The scope of work has grown to the restoration of the entire front facade – removing aluminum siding, repairing rot and portions that the siding installers cut the architectural details away. Back at the office our June newsletter was mailed (a day late) and we are investigating the e-newsletter options on Constant Contact. If you would like to be added to our e-mail list please e-mail [email protected]. In our June newsletter we introduced the Speedheater Paint Removal System – if you are interested in a demonstration or rental please call us we would be happy to accommodate any requests. The office number is 717-291-4688. Father’s Day Weekend we had a wood window repair class. We enjoyed our time teaching and getting to know the participants – look for pictures and video of this class to be added to our website soon. One thing that we have heard from almost all of our participants is that they thought there was some mystical secret to restoration. We spent sometime during the class discussing that the majority of restoration work can be taught within a relatively short amount of time – these usually are the repetitive labor intensive projects – and if the building owner is willing to contribute some “sweat equity” the cost of restoration can be greatly reduced. Of course there is a percentage of the work in which skill and expertise are required – which is the work we enjoy doing (the detail orientated – finish work). Have a happy Fourth of July – enjoy sometime with your family cooking out and watching fireworks! Historic Preservation Incentive Program (HB 221) is a piece of pending legislation that will help preserve historic structures across Pennsylvania. The legislation is designed to encourage people buying, selling, or dealing with historic buildings to be sensitive to the buildings history. This legislation will give more incentives to homeowners and developers making more grants and tax credits available for the preservation/rehab of historic structures. This legislation would help the state in multiple ways: preserving our collective built history, encourage economic development, and reinvest capital in our cities and towns. Twenty-nine other states have already enacted similar legislation. Today is the first day of summer and also bring your dogs to work day. So we decided to bring our dogs to the office and take pictures of them in while they “work”. Delilah (Jack Russell), Analiese (White German Shepherd), Bernadette (Am Staff), and Angelica (Pug) have made our day a little more exciting. On a more serious note we had a successful hands-on plaster class last weekend (June 14th and 15th). We have posted pictures and video from this class on the class portion of our website. Chuck and Jonathan spent both days teaching how to plaster an entire wall from scratch using lathe and a traditional three coat plaster method, how to patch holes, and how to repair cracks. Despite the warm weather everyone left feeling confident in their ability to tackle the plaster projects in their own homes – which was our goal. It was a hot day with high humidity on top of the heat – I would describe it was oppressive. We made due with the weather (which impacted the turn out) and moved our presentation into the park gazebo were there was shade and benches for the attendees. Despite the small crowd we had a good time discussing the importance of wood windows to a historic building, the replacement cycle (caused by inferior new growth wood and modern construction practices) (the replacement window salesman was not happy with this aspect of the discussion), storm window options (interior and exterior), the energy efficiency of wood windows (with support from the University of Vermont Wood Window Report – showing the energy savings is less than a dollar a year when wood windows are replaced with modern replacement windows – a copy is available under the Services section of our website), how to make wood windows more energy efficient, and a demonstration of the steps to repair wood windows. We enjoyed sharing our knowledge with the few concerned homeowners and the Borough of Bellefonte’s available HARB members. We look forward to visiting this Victorian city again in the near future. We are a residential restoration company focusing on the preservation of our collective built history for future generations. We hope to help educate our clients and the general public to care for their older buildings and make decisions that will benefit the preservation of the building.